Что же касается обсуждения новых правил WRO 2015, то подразумевалось что организаторы в живую покажут игровые поля, а также ответят на все неясные вопросы по регламентам. С нетерпением ждем выхода новой версии правил, в которых найдутся ответы на вопросы, опубликованных в предыдущих заметках (младшая, средняя, старшая). А в этом же сообщении приводится список вопросов, который был задан для Студенческой Категории WRO 2015. Если у вас есть чем дополнить этот список - добавляйте свои вопросы в комментариях. G.3.2 Is it allowed to use LEGO parts to connect sensors and the EV3/NXT brick to the main construction of the robot? G.3.2 Is it allowed to modify MATRIX/TETRIX parts, e.g. bend or cut them. G.3.2 Are there any limitations on the robot batteries/power supply? G.3.3 Currently it says "any C language (like C or C++) software". Is it allowed to use RobotC, NXC? G.3.3 Is it allowed to use any FW on NXT and EV3 (nxtOSEK, ed3dev, other customized FW)? G.3.3 If an interpretor SW was written on C/C++ but it operates by reading an instructions (like move a motor, get a value from a sensor etc) from a text file prepared and uploaded to the brick, will it be allowed? If so, can be the interpreter SW prepared for PC/notebook which actually will behaves as a compiler - it will prepare a bytecode understandable by the brick FW (like Java and leJOS) - will it be allowed? G.3.4 Can the sensors be not manufactured but prepared by the team members (e.g. they would like to develop their own IR sensor)? Can the sensor be built based on Arduino board? RaspberryPi board? other prototyping boards? Especially if the sensor is used to capture and process video streams. How complex the sensor could be? What is the difference between sensors: one sensor processes an image for the camera and returns an angle between the current position of the robot and the object needs to be handled and another sensor do the same but returns power for the motors, their direction and duration in order to the robot gets targeted to the object? G.3.5 When we say "motor", are we considering just a device which transforms energy into a rotational motion? In other words, is a solenoid allowed to roll the ball? G.3.5 Is it allowed to use non-electrical motors (petrol, steam)? G.3.10 "Teams can assembly robot before the game." Is it better to rephrase it to say about entire competition rather than a game (which actually means "the first attempt in the first round"). G.4.1 The rules do not describe actions the judge should perform if he/she found (e.g. on the quarantine time) that the robot violate the rule "The maximum dimensions of the robot must be within 450mm x 450mm x 450mm". G.4.3 "Any radio communication, remote control and wired control systems are not allowed while the robot is running." But it is allowed to use "maximum two controllers if EV3 or NXT" as per G.3.6. It is necessary to note, that two NXT bricks can only use one evident way to communicate to each other - by BlueTooth. So, if it is turned off, so there is no way to synchronize these systems. Similar is applicable for two EV3 bricks. Also it could be imaged that the controller would like to communicate to a sensor by using a wireless protocol. Will it be allowed? G.6.6 "individual games may not exceed 180 seconds". It is not clear. One game may not exceed 180 seconds or all 3 games in the first round? G.6.9 What does the action "to reposition the bowling pins" mean? G.6.10 It is not clear what actions the judge should do if he/she recognized that the robot violate the rule "robot can carry one ball each time only." RR.2.2 "The position of the green bowling pin will be determined after “Practice Time”". Could you clarify? Is it the "Practice time" before the second round? Or before the first round? Will the position be the same for all games in the round? When will the position of the green pin be defined during the final round? The "Rules and Regulations" section does not specify what "obstacle pins" means. It is done later in the Scoring section. Can the definition be introduced in the Rules and Regulations in order to do RR.2.3 more clear. RR.2.10 needs to be corrected in order to get rid of ambiguity in the phrase "Robots will receive 6 points if they successfully pick up a ball each time (i.e., these 6 points can be obtained if a robot picks up a ball in each game). ": It actually means that 6 points are gained if at least one ball is picked up, the second ball will not be taken into account. RR.2.11 Please clarify "otherwise the robot will receive zero points for that game.". Will 6 points for the ball picked up as per RR.2.10 be canceled? RR.2.11 "The ball must be released before the foul line on the right, and the projection of any part on a robot may not touch the foul line". 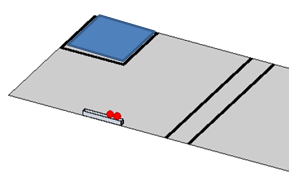 Can the projection of any part on a robot touch the line after the moment when pins are knocked? RR.2.13 What if due to a judge mistake the pins area is not cleared in 10 secs and the robot starts another attempt to roll the ball? Currently RR.2.15 says "If the robot rolls all its balls". As per the game the robot can roll just one ball (in case of strike). Another option is that the robot could be programmed in such way so it could roll just one ball: pick up the ball, roll it and return on the base regardless the success of the throw. Will the robot gain 3 (+2) points in such case? Will the robot gain the points for the finish if it just picks the ball up and returned in the base area? Or it must roll it? What does "roll" mean? Can the robot try to pick the ball up but fails as so the ball is on the floor? Will it be considered as "roll"? RR.2.15: is the black line part of the base area? What if the robot is moved as it is presented on the picture? So, its right side will on top of the black line when the robot finishes. There is nothing in the rules about the timer. 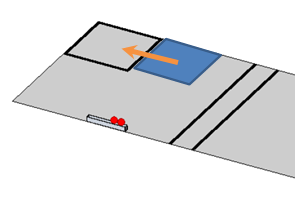 What if the timer is stopped during the throw - at the time when the ball is not on the robot already but not touches the pins area yet. Will the pins be taken into account as knocked down by the ball after timer stopped in this case? The "Rules and Regulations" and "Scoring" sections have the same numbering. General Rules 4.1 says that robot is not restricted to exceed 450x450x450 after its start. But the item 3.3. of the "Lane specification" sections says "During the entire competition, the robots must not leave the 450 mm × 450 mm × 450 mm area". The "Lane Specification" in the item 3.7 introduces "the creative challenge games". It is necessary to point out that it is actually the 5th game of the final round. It can be imaged that the robot does not roll the ball but throw it. As so the ball touch the field only in the pins area. Is it allowed? Can the robot use any device to knock the pins for example by air or water? What the material for the field is suggested? Is it necessary to add a note that the field will be leveled properly?